Wave-On-Lea01263 715779work01603 870304fax Self-cateringSitting just behind the seafront this pleasant second floor flat will give you a view of the sea as you wake up each morning in your spacious bedroom. It also offers a good sized sitting room, compact but well equipped kitchen and a bathroom with over-bath shower. Set in a quiet residential location just a short stroll from the town's amenities, the flat is in a great location for exploring the north Norfolk coast and charming inland towns and villages. Seaside villages such as Blakeney, Morston and Wells-next-the-Sea to the west and Cromer, Mundelsey and Happisburgh to the east all have their attractions, with lovely beaches and great walks. The Georgian town of Holt can be visited on the locally run steam railway, which takes in a picturesque coastal route where you will find an eclectic mix of gift and clothes shops, cafes, antique and art galleries, restaurants and pubs. Sheringham itself also has plenty of entertainment such as golf, the Little Theatre, Sheringham Park, sea fishing and tennis & squash at nearby Cromer. Sitting just behind the seafront this pleasant second floor flat will give you a view of the sea as you wake up each morning in your spacious bedroom. 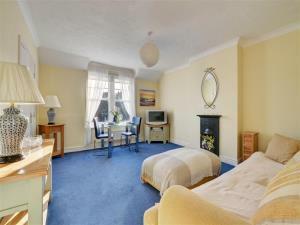 It also offers a good sized sitting room, compact but well equipped kitchen and a bathroom with over-bath shower. Set in a quiet residential location just a short stroll from the town's amenities, the flat is in a great location for exploring the north Norfolk coast and charming inland towns and villages. Seaside villages such as Blakeney, Morston and Wells-next-the-Sea to the west and Cromer, Mundelsey and Happisburgh to the east all have their attractions, with lovely beaches and great walks. The Georgian town of Holt can be visited on the locally run steam railway, which takes in a picturesque coastal route where you will find an eclectic mix of gift and clothes shops, cafes, antique and art galleries, restaurants and pubs. Sheringham itself also has plenty of entertainment such as golf, the Little Theatre, Sheringham Park, sea fishing and tennis & squash at nearby Cromer.